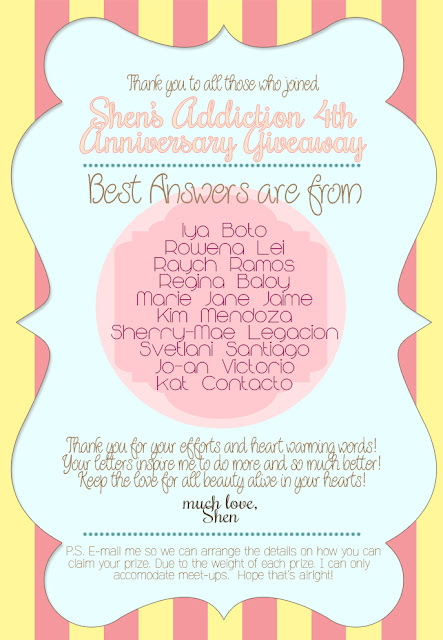 I was so ecstatic to see my name on the winners list of Shen's Addiction 4th Anniversary Giveaway. I've been looking forward to it since the long weekend and just last night I saw the announcement on Shen's blog. I've been a silent follower of Shen's Addiction for almost 2 years now, but it's my first time to participate in one of her many giveaways. Aside from the very tempting prizes, I felt the requirements for joining were easy to accomplish especially the question "how did Shen's Addiction beauty blog encouraged you to explore beauty?". For me, that query was far too easy to answer because I didn't have to think hard about it and in no time, I came up with a lengthy (not too boring, I hope) narration of my fascination for skin care and beauty products and how Shen's Addiction took part in it. To Miss Shen, you don't have a clue how this simple announcement lifted my spirits. Thank you again from the bottom of every vital organ in my body. To everyone else who won, congratulations! I was invited to attend a Bloggers Convention soon but it actually falls on a Sunday so I'm still thinking it through. I wish I can take better pictures to share in my blog, especially before and after images to really show the difference.